The zero in the number 605 is the earliest zero we have ever found. 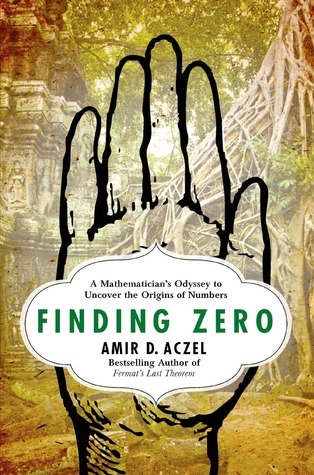 Finding Zero is a clever documentary-style account of Prof Aczel’s journey to locate the oldest known relic containing the concept of zero (represented on K-127 as a dot). It reads like a journal written in first-person narrative, taking account of hotel room experiences, unfruitful cab rides with a driver who was not an actual taxi driver and did not speak a word of English (except the word “hotel”), and having to pay a customs official $200 cash for some bogus passport red tape. Particularly amusing was the comparison to Indiana Jones having a priceless and hard-earned artefact snatched away from him at the last minute; when Aczel finally found K-127 after years of effort, he was so elated he shared this find with 2 archaeologists who just happened to be seeking items for their restoration classroom and wanted to teach their students how to restore something valuable. Eventually Aczel was able to convince officials this item was better off in a museum, but the sense of euphoria from the discovery followed by the feeling of extreme loss was well conveyed in Aczel’s personal account. A little dry at times with indiscriminate details of many travel experiences, overall the book was enjoyable to read, and was one of Prof Aczel’s less-scientific writings; very few equations appear in this one. It was interesting to see how his early interest in numbers and mathematics was cultivated in his youth while travelling on a ship with his father as captain (catapulted by a forbidden under-aged adventure into a casino where numbers rule the world). Anyone who shares an interest in the history of numbers and mathematics will enjoy reading this one. Every Litographs t-shirt is created entirely from the text of a classic book, and is hand-pressed to order in Cambridge, MA. Our shirts are printed via all-over dye sublimation, which means that the design – the text from each book – covers every inch. Of all the printing methods we’ve tested, dye sublimation stands out for its resolution, comfort, and durability. “The arc of the moral universe is long, but it bends towards justice.” Martin Luther King Jr. I would recommended this book as a fantastic follow up to Steven Pinker’s “Better Angels of our Nature” and Matt Ridley’s “The Rational Optimist”. Beginning with the famous march to Selma, Alabama led by Martin Luther King Jr to fight for the right to vote, Shermer takes the reader on a journey that makes the irrefutable case that morality is on an upward swing (arc). 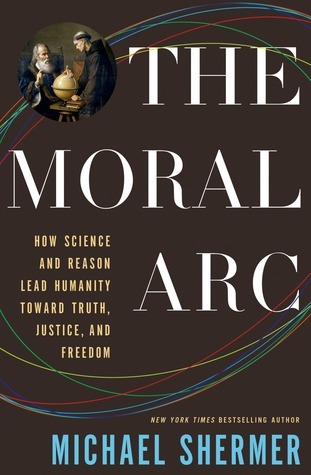 Using easy to read prose and references to several reputable scholars such as Steven Pinker, Richard Dawkins, etc, the author delves deep into the human psyche to explain how immoral acts can be committed by moral people, and that we are improving how we treat each other through education, communication, and a higher awareness. This book made me proud to be a member of the human race, flawed as we are – we are always getting better. We human beings share 98 percent of our genes with chimpanzees. Yet humans are the dominant species on the planet – having founded civilizations and religions, developed intricate and diverse forms of communication, learned science, built cities, and created breathtaking works of art – while chimps remain animals concerned primarily with the basic necessities of survival. What is it about that two percent difference in DNA that has created such a divergence between evolutionary cousins? 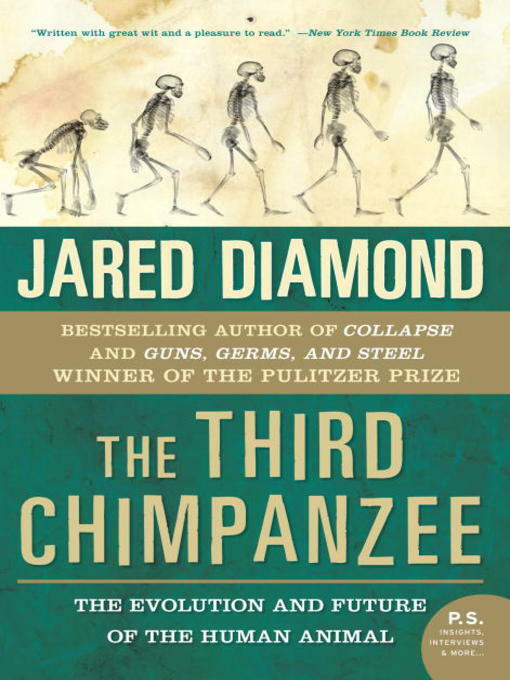 In this fascinating, provocative, passionate, funny, endlessly entertaining work, renowned Pulitzer Prize-winning author and scientist Jared Diamond explores how the extraordinary human animal, in a remarkably short time, developed the capacity to rule the world . . . and the means to irrevocably destroy it. Diamond explores concepts relating to the animal origins of human behavior, including cultural characteristics and those features often regarded as particularly unique to humans. It further explores the question of how Homo sapiens came to dominate its closest relatives, such as chimpanzees, and why one group of humans (Eurasians) came to dominate others (Indigenous peoples of the Americas, for example). One of the interesting things I learned from this book: there is a field of study called “Linguistic Paleoentology”. It is a linguistic and subsidiary historical discipline that uses linguistic data to derive information about the history and geographical location of the speakers of a particular language. Linguistic paleontology also aims to obtain information about the material and spiritual culture of the speakers in the preliterary period. Overall, this book is a facinating read and recommended to anyone interested in the anthropological history of our species. Over five major sections, Diamond educates the reader on the core issues of evolutionary biology, explores these issues as they related to timeless moral questions, and examines the role our biology plays in determining our future. US scientists celebrate the restart of the LHC | symmetry magazine. The Large Hadron Collider circulates the first beam of Run 2.